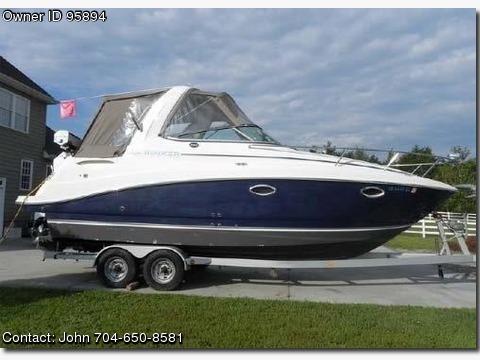 Call Boat Owner John 704-650-8581. This RINKER 260 Express has a lot of featured and the cabin is well appointed, An upgraded Stereo system with sub woofer and an on deck TV have been added, The boat is equipped with a 7,000 BTU KOHLER generator and Heating/AC, The deck and cabin are spacious and good for entertaining or for a weekend getaway as the boat sleeps 4, The captain is going to like this boat because the helm includes capable electronics plus there is a Windlass anchoring system which makes the boat easy to operate alone if necessary. All the documentation for the boat, motor, electronics and on board systems will come with the purchase of the boat. It will be obvious to the buyer that the boat has been well cared for and not heavily used, The engine room is clean as is the outdoor wet bar, the galley and the head. Boat Location: Rock Hill, SC.